It is no bad thing to celebrate a simple life! Oft quoted but rarely realized outside of the military. No greater love has a man than that he give up his life for another. John 15.13. This is the essence of servant leadership, a form of leadership often expoused but not often observed. We see one Marine shot and badly wounded. His fellow Marine has come to his aid, come to his aid in full knowledge that his own life was on the line. This is what Jesus talked about. This kind of cost and this kind of leadership. A good military leader is the one who leads his men from the front. That is why there is a high percentage of second lieutenants killed in combat—they are leading from the front where the danger is highest. So too a good leader will lay down his life to save the life of those in his charge. And such a leader cares not if that Marine pulls for the same sports team, espouses the same politics, philosophy, taste in music. Such a leader cares not whether that soldier lying wounded is his best soldier of if he is a brig rat. That leader places his life on the line to come to the aid of his soldiers. Period. 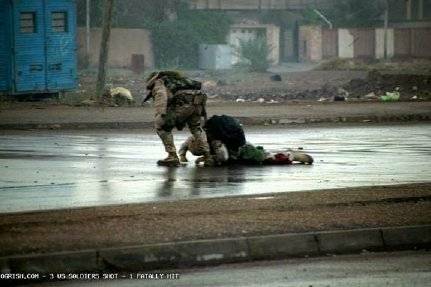 In the above picture, the wounded Marine lived. The one who went to his aid did not. He laid down his life. How often do you see this in the corporate world? How often will a boss take the hit while protecting those who are his responsibility? And we are only talking about giving up a job, a career, or advancement. How often do you see it in the church? And the church should be where you see it the most, shouldn’t it? If you are not willing to give up much less than your life to protect those whom you serve, how can you talk about giving up your life?